Click the Sign In link found under the MBA logo. On the Sign In box, click Forgot username link. Enter your email address and click Submit. You will receive an email with your username information if you are in our system and a link to create a password. If a password already exists, you can reset it by using the Forgot password function found on the Sign In page. 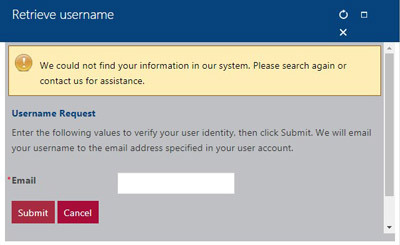 If you receive the message: We could not find your information in our system, return to the home page and click the Create Account link found under the MBA logo.